Home › Why Choose Wood Fence? Wood is a perfect material for garden fences and a variety of other applications, but, like every other fencing material, it has its pros and cons. Wood rots, is susceptible to wood-boring insects like termites, contributes to deforestation, requires routine maintenance, and doesn’t offer security for industrial complexes and businesses like aluminum fencing does. There are still a lot of great reasons to choose wooden fencing, though. When you think of a house in the suburbs with a white picket fence, you’re probably imagining wood fencing. Wood fences offer a more classic aesthetic than any other material. Even vinyl fencing, which is manufactured with wood grain texture, don’t compare to the natural beauty of wooden fences. Moreover, despite rising costs of shipping and logging, this option is still one of the most affordable around. Wood is also a renewable resource that’s easy to get a hold of. It’s even biodegradable. While it might be difficult to find vinyl or aluminum fence companies near you, most hardware stores carry the materials necessary to build a wood fence. If you have concerns about longevity, there are a lot of options for increasing the life of wood. The material can be stained and treated to resist rotting, damage from the sun and rain, and bugs. If treated and maintained, a wood fence can last quite a while. Unlike other fencing supplies, wood is also very easy to install, repair, and maintain. Aluminum and vinyl fences require very little maintenance, but can be very difficult to repair when damaged. Wrought iron is expensive and rusts. Since wood is so readily available, though, it also tends to be very cheap. Taking a few nails out and replacing a rail is much easier and cheaper than removing a panel of aluminum fence and replacing the entire section. 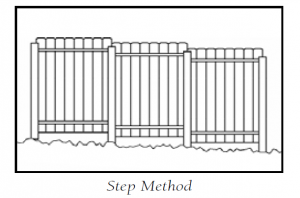 Additionally, wooden fencing is simpler to modify, customize, and install on a slope than other options. Fence posts can be cut and painted to suit any aesthetic and still offer the same level of privacy that only vinyl fences do. Learn how to install wood fencing right now. 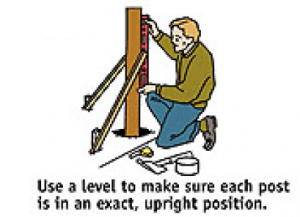 Click the left button for step-by-step instructions or the right button for tips on positioning fence posts.